We were invited to a Tibetan wedding the other day. The bride was flown in from the Ba area of Kham, and wore a wedding dress typical of her home region. She looked stunning with all those ornaments around her waist, neck and head. The Western-born groom and his family wore traditional garb too, just like most of the guests, including my own little family. We all must have looked like we stepped out of a pictorial “Costumes of Ancient Tibet”. 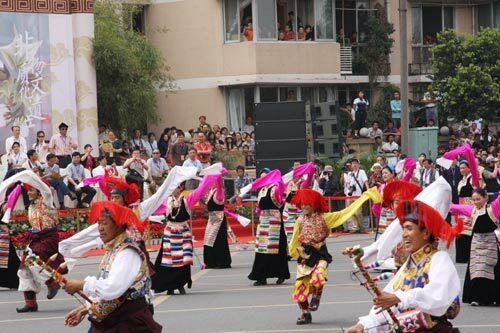 It was a typical Tibetan wedding with hundreds of guests - none of which were required to sign up or off by the way - plenty of food and drink, in a merry atmosphere of a folk festival. But what made this wedding particularly memorable was the music and the fun time we had dancing. “Alè”, she went, looking at me as if I were the one coming from another planet. But the great thing was, she and a lot of other people without Bapa connections, felt the groove. They were all on that stage with the dancers, laughing away, having a good time: Western friends on the groom’s side, Toepa moms, Lhasan couples, Tsangpa elders, a few Amdowas, and Mountain Phoenix with her kids, trying to look “normal” up there. We were all led by the beautiful young bride, who was an exceptionally graceful Bashè dancer. The Western-born groom didn’t dance. 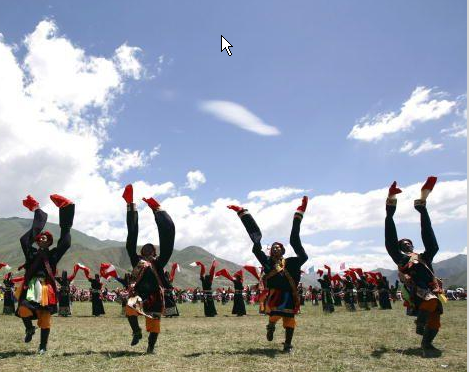 No matter how staunch a patriot he may have been, but like most folks born outside of Tibetan culture, the singing and dancing part just didn’t click. It would have looked out of place also, because meanwhile he had changed into Western attire completely. My partner? - Never sings nor dances in public. But he’s excused, as far as I’m concerned, because he is among the few, who manage to look masculine even in the funny male Chupa. The thing that sticks out with Bashe is it can be very modern with really cool, outgoing moves, often involving all parts of your body, including rowing with the arms. There is more freedom for physical expression. Not that you can create your own moves, but within a move, you have space for individual interpretations. At the same time, the music can be spiced up with contemporary beats while the basic step combinations remain technically the same. This makes Bashè a true folk dance, a down-right communal undertaking with three generations dancing to the same music. That’s amazing! Another thing about Bashè is it’s always sung with fervor. The melodies are usually simpler than from the central areas, but that’s being compensated for by a lot of passion in the voice. 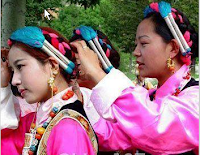 The lyrics are easy: Most of he time it’s longing for or praising your phayul, the snow-capped mountains, the beautiful grasslands, your parents, or your lama - with lots of repetition in between. The thing is: To really feel the groove, you have to dance along with all the others, while also singing at the same time: that's at the heart of the Bashè magic. People who only dance along but can’t sing, look somehow out of place. And people who sing without understanding the meaning are also unmasked pretty fast because their dance lacks character. But there is something else to Bashè, beyond the fun factor, something really wholesome. Remember a well-known contemporary son of Ba, the infamous Bapa Phuntsog Wangyal? After he fell from grace, the one thing that he says helped him survive those years in solitary confinement, was singing and dancing the songs of his hometown. - Good for the old man the repertoire of Bashè folksongs is virtually infinite! Lasted for 18 years! Bashè as life-saver! 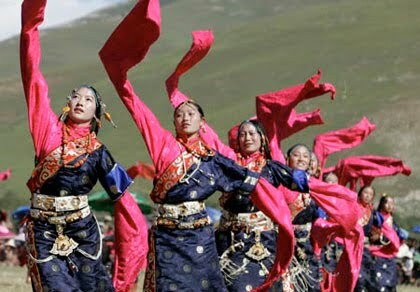 A friend, who works in a home for asylum seekers here, told me, there are new arrivals from Tibet who play this music day in and out. It helps them endure the foreign environment and relieve them from their homesickness. Life in four-four time…Bashè as emotional healing! Maybe an innovative musician could transform Bashè for a broader audience. Like Bangra which also has local origins, but is spreading beyond the Punjab and even beyond the borders of India… or Reggae coming out of Jamaica but now being played all over the place… Bashè as Tibetan musical export to the world! 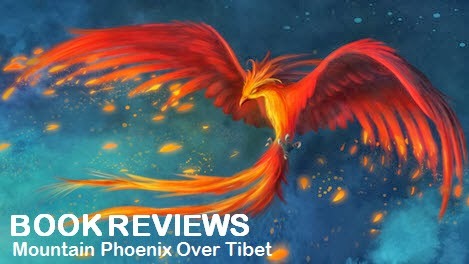 Once in a blue moon, even Mountain Phoenix, the part-time Tibetan, gets depressed with homesickness. The only thing that really helps in those moments is to buy a ticket and fly to Tibet. But as that’s hardly ever possible, the next best thing, which kind of works too, is plug in a Bashè VCD and imagine she is hanging out with those singers and dancers in the grasslands on a beautiful, sunny day, surrounded by magnificent snow-capped peaks… Bashè as antidepressant! I vowed to learn those glorious songs and sing them to my children. By now, they know about half a dozen, picking up in no time. And just casually along the way, we all also work on our Tibetan. On the lookout for fun ways to teach your kids Tibetan? Use Bashè as a language-teaching tool! Bashè forever – Yallaso! Tashi-sho!